Many times human eyes ignore slight details that differentiate one thing from another. This happens especially when our mind follows Top-Bottom strategy and chooses to focus on the whole picture first instead of its parts. Americans, who see water birds regularly, get confused often due to this deception of human eyes. Among the most confused birds are Heron and Crane whose similar appearance makes it difficult to differentiate between them. This article aims to direct human eyes to pin point those little differences and correctly recognize the bird in front of them so as to become an expert bird-watcher! Cranes belong to the family Gruidae, which has about 15 species worldwide and only two native to North America. The whooping crane is the largest bird in North America, measuring 52 inches in height, with a wing span of up to 7 feet. The sandhill crane also has a 7-foot wing span. 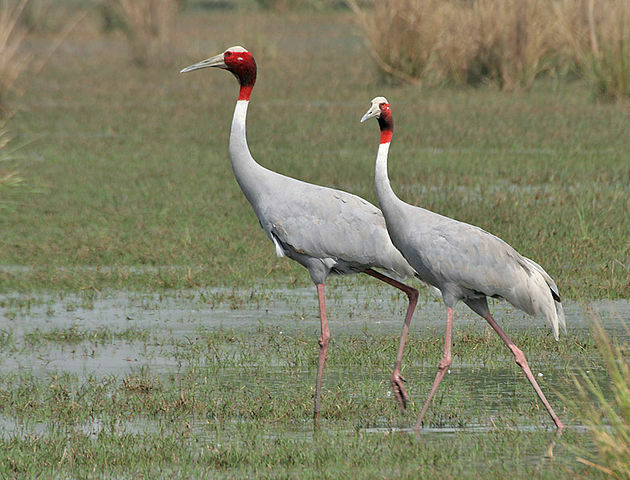 Crane is an extremely rare bird; only 220 whopping cranes live in the wild today and almost the same number in captivity. They are found in marshes of Canada’s Wood Buffalo National Park or Wisconsin in summers, Texas’s Aransas National Wildlife Refuge or Kissimmee Prairie in winters. Herons belong to the family Ardiedae. Many types of Herons are seen in North America like Great Blue Herons, Great White Herons, The little Blue Heron, Green Heron, Black-crowned Heron etc. Great Blue Herons are seen throughout the United States, Mexico and Canada whereas Great White Herons are only found in Florida. Other species of Herons are smaller in size and rarely confused with cranes. Great blue herons stand up to 46 inches tall, and have a wing span of up to 6 feet. Other heron species can stand up to 25 inches tall. The Cranes and Herons carry their heads in a very different way. Cranes’ head, beak and neck are proportionally heavier in weight than their bodies, which is why they have to curve their neck in an “S” when they fly. On the other hand, Herons’ neck is light in weight and they fly with their necks outstretched. Another difference that can be noticed during their flight is that cranes have sharp movements in their wings and they raise their wings above their bodies while flying. Herons wing movements are slow and usually they keep their wings parallel to their bodies during flight. Another difference between these two types of birds is that Cranes are very social. They are mostly seen away from trees, together, in wide open spaces. Herons like a solitary life. They are mostly spotted hunting or flying alone. Some Herons even attack other Herons if they do not like their presence. Herons will perch in trees as well as marshes, riverbanks, sloughs, grasslands, fields and even backyard ponds. Their social behavior is evidently very different. Herons tend to build solitary nests while Cranes mostly nest amongst several hundred of their species. The color of Herons and Cranes also differs. Cranes are mostly white with a black face, black legs and a darker and thinner bill than Herons. Herons exhibit a wide range of color combinations. Both Cranes and Herons eat fish in a similar manner but Cranes use their bills to dig in the ground for food. Herons, on the other side, stalk their marshland prey and use tools to attract food. Cranes perform a dance that no other specie does. Walking slowly in a rolling strolls and their neck held out straight, Cranes appear very different from Herons. allana. "Difference between Crane and Heron." DifferenceBetween.net. March 18, 2015 < http://www.differencebetween.net/science/nature/difference-between-crane-and-heron/ >. The article “difference between cranes and herons” has errors–cranes fly with neck outstretched and herons fly with neck tucked in “S” shape. I heard of that! I saw it myself!!! Three other websites say it’s the heron with the heavier head and the S shaped neck in flight, this one says the opposite? A misprint or are all the others wrong? Herons are the heavy headed guys and almost always fold their necks while flying actually looking like another type of bird. You must correct this error immediately cause folks are quite confused on this issue and don’t need the conflict in information. After landing they may keep folded partially extend or fully extend their necks. Usually extended while searching for small fish, crooked to make the spear. Very fast! The info is wrong on some differences between cranes and herons. CRANES have smaller, sleeker heads, and fly with their necks straight. A HERONS head weighs proportionately more than it’s bodies and flies with it’s neck curled in an “S” shape. There is also a video giving out the same misinformation. If it’s yours, you may want to change that too. Try searching youtube for ‘blue herons flying’ and ‘sandhill cranes flying’ to see the difference for yourself. about a distance of 1 meter. I felt like saying, “WTF!!!!!!”. Previous comments from 3 years ago are all correct about the cranes necks held straight and herons in an S while flying. Please correct your website! !